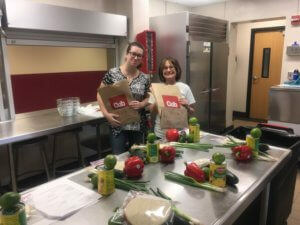 MAND member Sharon Lehrman’s volunteer coordinator position for Cooking Matters classes for the residents of St Louis Park was a natural progression of my growing interest in food insecurity, equity, and resilience. In a partnership with the University of MN Extension, SLP SEEDS, the school district, and our local emergency food program, we are providing free cooking classes to residents of St. Louis Park. Cooking Matters, a 6-week program developed by Share Our Strength’s No Kid Hungry campaign, helps individuals and families to shop for and cook healthy meals on a budget. Participants attend classes co-facilitated by a nutrition expert and a culinary professional, observe recipe demonstrations, help prep and cook a meal, eat together, discuss nutrition tips, attend a grocery store tour, and each week take home a bag of groceries to recreate the meal at home. Everyone involved in the facilitation of the classes is a volunteer and the class is free to participants. We have gotten wonderful feedback both from the volunteers and participants about the life-changing nature of these classes! If you’d like to find out more about volunteering for a Cooking Matters course in St. Louis Park, please contact Sharon at SharonLehrman@gmail.com. If you are outside of the metro area there are also Cooking Matters courses offered all around the state and I can put you in touch with my contact at the University of MN to see if there is one near you.